During the rites of passage ceremonies of many of the Indian tribes in the American Southwest the person to be initiated is fasting and praying for days. This cleanse includes spending days in isolation or alone in the wilderness. For the ceremony the person is taken to a sacred place like a mountaintop or a cave by a medicine man or woman. There he is offered a tea brewed from roots, leaves and even seeds of the sacred datura plant to bring about visions. 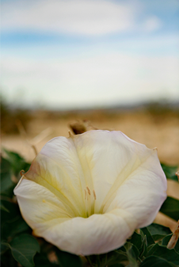 Besides being used in rites of passage the datura plant is also used to put a magic spell, a ban or a curse upon somebody, to initiate sleep and dreams or to protect from evil.